One of the fundamental parts of an archaeologist’s job is to find archaeological sites. There are many ways to do this, from intensive walking surveys, historical records, and Indigenous oral histories and traditional knowledge, to computer modelling, remote sensing and, finally, aerial photos or satellite imagery. However, one often overlooked source of information is the knowledge of local residents who live in the study area and have encountered archaeological sites near their homes. 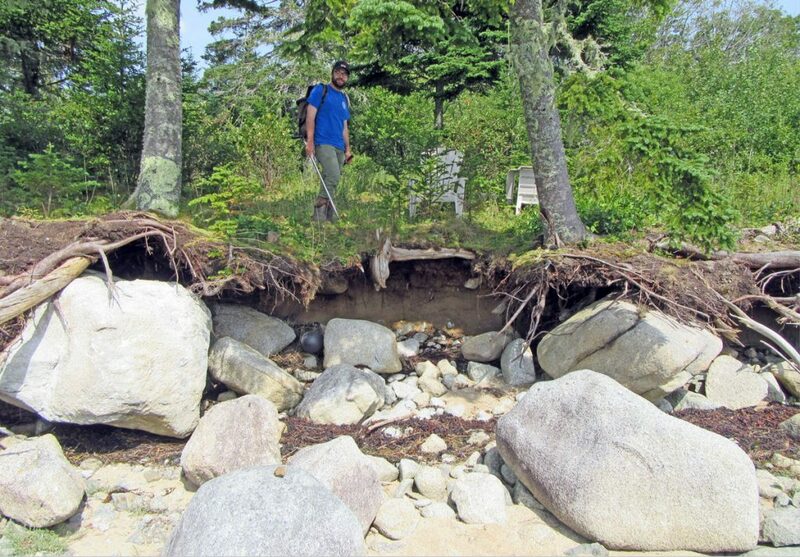 A new Canadian Museum of History project involves looking for sites on the South Shore of Nova Scotia, where coastal erosion — caused by rising sea levels and climate change — is endangering archaeological sites. This erosion is so severe that many sites discovered only decades ago have now been completely destroyed. The new project aims to find and excavate the remaining sites before they are literally swept out to sea. This initiative is being undertaken in close collaboration with the Acadia First Nation, whose history is the most endangered by this erosion. The inaugural season of the COASTAL* Archaeology Project was launched in the last weeks of August, 2017. Our aim was to visit and assess known sites and survey for new sites. Surveying is very time-consuming and, given the level of erosion on the coast, any delay literally means the loss of more information. We decided to appeal to the public to help us find sites before they are completely lost to erosion. On August 22, we held an event at the Harrison Lewis Coastal Discovery Centre, in the middle of our survey territory, which we called “What’s the Point: Archaeology Show and Learn.” We invited anyone who lives on the South Shore to come to the centre with any ancient artifact or “treasure” that they may have found. With the collaboration of the Nova Scotia Museum, we offered to inspect and identify each object and determine how old it was, in return for any information the finder could remember about where it was found, and in what context. The turnout was better than we ever could have wished and, despite the remote location, almost 40 people showed up with about a dozen collections. People brought their artifacts packed carefully in containers such as fishing tackle boxes and Tupperware. One person even had his display preserved under glass in his coffee table. The results of this event were incredible! People showed us stone points and axes they had found which dated to more than 3,500 years ago. A large collection of hundreds of ceramic fragments dated to the mid-19th century. One individual brought items he had found which spanned a period from about 4,000 years ago right up to the arrival of Europeans. In the end, participants in this event revealed about 10 sites that had never been identified by archaeologists — sites that will be the focus of investigations in coming seasons. Some brought in objects that turned out to be curiously worn stones, but the information they shared is no less useful. Knowing where not to look is as important as knowing where to focus our attention. While our goal to learn about new sites was successfully achieved, another goal — community outreach — was met with equal success. 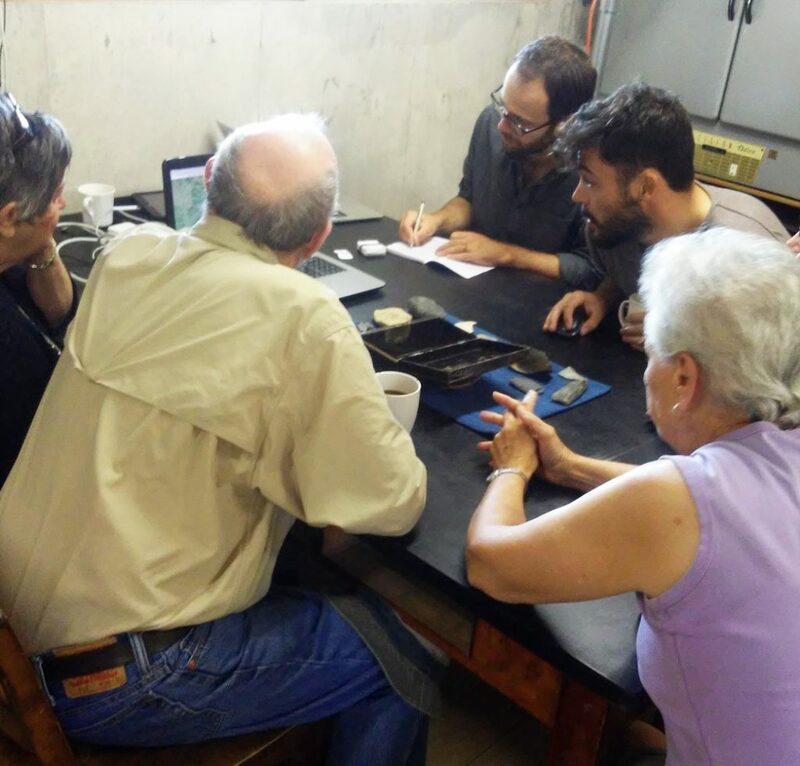 Learning about the artifacts they had recovered, some found many decades ago, is important to those who are so interested in their local history. At the same time, we took the opportunity to educate our visitors about what they should do if they find more artifacts. Such engagement is a crucial part of archaeology; there are no better stewards of the archaeological past than the people who live on the land where it is buried. If you do discover an artifact, you should not disturb the site further or “dig” for other artifacts, as doing so will only cause more destruction to the site. Instead, report your find to the provincial authorities. Visit the Nova Scotia Office of Special Places website for more information about the Special Places Protection Act, as well as for contact information. *COASTAL stands for Community Observation, Assessment and Salvage of Threatened Archaeological Legacy.